Lebanon drivers know that Jeep vehicles are built for fun and adventure. These exciting Trail Rated® SUVs can be customized for increased performance comfort thanks to a variety of Mopar® accessories. 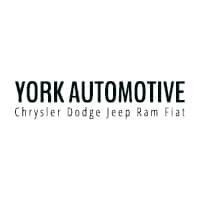 Discover all the possibilities at York Chrysler Dodge Jeep Ram FIAT. Skid Plates: Protect vital vehicle components when travelling off road. Rock Rails: Offer lower body protection. Stage Kits to increase horsepower and torque. Amplifiers to boost your sound system. Customize your Jeep at York Chrysler Dodge Jeep Ram FIAT today. Check out our Mopar® coupons to save money on your upgrade. Stop by our Parts Department near Lafayette to speak to our certified technicians, or if you know what you want to add to your Jeep, you can order parts online.